Bringing the musical tradition of our ancestors into worship services is precisely what Berenshteyn does as the music director for Beth Ahabah. “I am involved in everything that has the word music in it,” he says. It takes a lot of scheduling and logistics—and rehearsing, rehearsing, rehearsing. 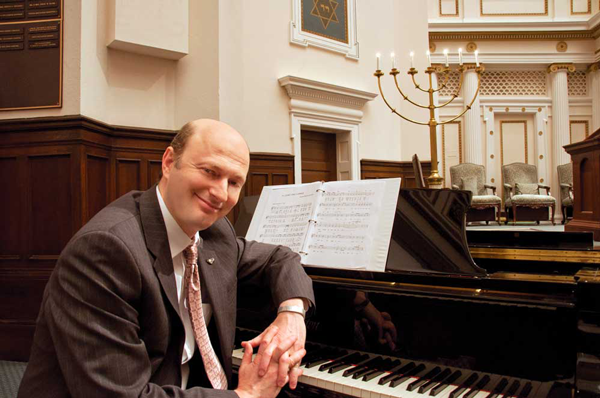 He plans the “musical menu” for services that feature the children’s choir, adult volunteer choir, the professional choir, and the cantorial soloist, and ensures that everyone has their music in hand when it’s time to start practicing. While producing everything from a Shabbat service to a special event requires a great deal of work behind the scenes, it’s Berenshteyn’s job to make sure the congregation never sees that. Berenshteyn has a bachelor’s degree in music education, focusing on choral music, and a master’s degree in music performance, concentrating on classical piano, both from Virginia Commonwealth University. In addition to his work at Beth Ahabah, he also teaches full time at Atlee High School in Hanover County.